It is cold and are you queer? How d' you make this sacrifice? How do you feel now that you are failed? at the Peace Camp, Newbury, Berkshire. and those I miss they'll surely yell them. What was the noise from in the base? Have you seen any cubs? Hulme, Janey: Greenham Common. New Statesman. Vol. 104, 1982. No. 2696 p. 14. It would appear that Newbury District Council is concerned with the aesthetics of the women's environment at Greenham Common. The tons of rock deposited there recently are to be tuned into a rockery. When a group from STAND (St Albans Nuclear Disarmament Campaign) visited the women's peace camp, we found it to be more reminiscent of Stonehenge than a US base. The reason for Newbury District Council's sudden interest in gardening is, of course, to prevent the camp growing again. Once the rocks are in place tons of soil are to be delivered and trees and shrubs planted. This will effectively stop the parking of caravans, the erection of tents and tepees, while hiding the camp from the road and keeping the women well hemmed in, in one small comer by the base gate. The women have taken all this in their stride. Since their vans were impounded by the police, and the entrance verges on which they camped dug up and churned into rivers of mud by Newbury District Council, they have 'camped' out in survival bags - even during those endless weeks of autumn rainfall. Officially, they are even forbidden polythene shelters, or fires, and could, at any time, be summonsed for possessing these. Anyone who has ever camped in bad weather will understand how impossible it is to keep things dry and to remain cheerful. 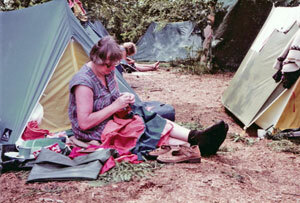 Usually, there is the alternative of packing up and going home - one which is not available to those at Greenham Common, unless someone can take their place. One of the women's main worries is that, should they be arrested, or suffer ill health during bad weather, no one will replace them. They would like to hear from women who would do so. When the rocks arrived, the women daubed them with peace signs and slogans. They also used a few hundredweight of the smaller, flatter stones to construct a cobbled path. The morning that we arrived, a gang of seven or eight labourers was drifting about the site, and a bright young thing from Manchester University (who is in charge of Landscaping) was loping, rather worriedly we thought, after a JCB earthmover, which was elephanting through the border hedges and depositing rock cakes here, there and everywhere. Some of the labourers told me that they had been hired for one day's work on private contract by the Council. I asked them what they were supposed to be doing. They shrugged. In the few hours that we were there, I saw only a few men met up ad move the odd boulder that had escaped the JCB's jaws. Meanwhile, pinstriped and smart-dark-suited men watched the activities from inside the base - it was rumoured that these were lesser gods from the Ministry of Transport. Amazingly, the little 'Tree of Life' survived the rock-onslaught, the big-boot-tread and the psychopathic, hedge-bashing JCB. The tree was planted when the Camp was established, and the women promised 'Trouble' should it be in any way damaged. It stands, though rather sadly, like a forgotten Christmas tree. - one little tatter of colour all that remains of its former decorations. 3. Said that they were going for a swim even if they weren't! Conservative-controlled Newbury Council encourages local people to make complaints about the women - who get little support from a township where many local people depend on the US base for work, and where they participate in the evening social life. 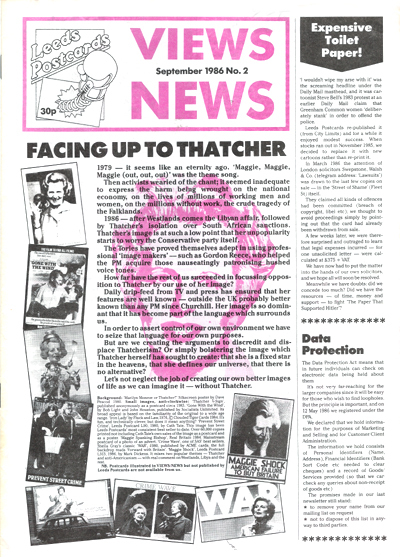 Selina, O'Grady: I was a Greenham woman.